We write, we read, we preach, we search for social change. So many people say the same things, have new ideas and claim that they would do something different if they had the chance. I've met many people who said that they would change this and that if they ruled the country. What they mean is that if they had the resources, they would be able to find innovative means of changing the way we do things. So many of the ideas are unrealistic, the real test for them is when we try and do them. I think the advertised grant below is a good opportunity for some people who want to bring about some sort of change with an idea. If you can't start with small ideas, how would you think of big ones when you rule Egypt? Now that there's a real opportunity, with realistic constraints (such as making money), I suppose it's much more difficult for the bloggers, the writers, the activists to put it in words and actually make something happen. I think it's always easier to have ideas when there is no chance of implementing them. But now's a time for someone to give it some serious thought. Yahoo! Maktoob and Nahdet El Mahrousa (a registered Egyptian non-governmental organization) yesterday launched a social entrepreneurship program and competition hoping to inspire young Egyptians to think about social entrepreneurship, and socially responsible business ideas, that are innovative and sustainable and can have a positive impact on Egypt. Visit the website and get inspired from the stories of nine successful, young Egyptian entrepreneurs and vote for the one who inspires you the most. 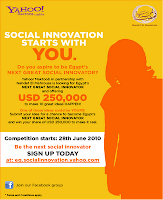 Then submit your idea for a social enterprise and enter the competition for a chance to win monetary support for your project as well as project incubation under Nahdet El Mahrousa’s Incubator of Innovative Social Enterprises.